It’s been crazy over at our house – between re-organizing, DIY, and just overall busyness, yup, crazy! But at the same time, it feels good to get things out of the way that should have probably been done a long time ago, but just never got done. Sometimes I think it takes a bit of frustration to get the final push to be inspired and to do something you’ve wanted to do for a while, because hey, we all get lazy or tired don’t we? Add to that a new job and a busy season, and it’s cause for chaos, but thankfully God is here! I have been praying non-stop, and asking for prayers too on different matters, and God is so Good! He has been letting us know just how much He cares, and though we know this, it’s been rough at times when we’re on the edge of our seats so to speak, waiting for answered prayers. Thank you to all who have been praying with us, you know who you are! 🙂 And so, I’d like to share a couple projects with you that I’ve been working on – here and there. Basically, I used my stud finder to locate the wall studs, drew some faint pencil lines to mark where those were on the wall, then drew a straight line across the stud lines (using my level). Next, I held the shelf brackets against the wall at the stud points one at a time as I traced the screw holes onto the wall for drilling points, making sure to put the brackets evenly along the level pencil line. I pre-drilled deep holes into the wall studs, got out my drywall screws, screwed the brackets to the wall, then I found some short screws, layed the shelf carefully on top of the brackets, traced the bracket holes onto the bottom of the shelf, (making sure the shelf was sitting evenly across the brackets), pre-drilled shallow holes into the bottom of the shelf, then screwed on the shelf to the brackets – et voila! A mini breakfast bar! As you can see, he can fit quite a bit of his stuff on there, plus there’s room enough at the bottom that he can work on his kid computer or play with his mini house. 🙂 Cute! Hope your DIY projects are going well, and God Bless you! P.S. – Feel free to share your own adventures in DIY by leaving a msg below. And if you like what you see, please Pin some for me! Thanks! Today, after a nice long (2hr) walk with my hubby talking about different facets of our lives, I just felt like I should write something so here it is: life is amazing even in the most mundane aspects of it. The fact that we’re here, breathing, controlling most of our body by sheer will all through electrical impulses, growing every day in some way, never mind all the unique talents and traits we each have, the list goes on… is all amazing. Many people do not look at the ‘minor’ things, or take notice of how God interacts in our everyday lives, but I am one of those people who is all about the details. Sometimes too much detail for my own good mind you, but still, that’s how I was designed, and it was for a purpose. It doesn’t matter what anyone else tells you with regards to the special traits you possess, so long as God knows you’re doing your best to use those traits for good, that’s what matters. I learned this the hard way, but I guess that’s the only way I would ever have learned it. You see, I was pretty stubborn as a kid, but I can say that God knew better and so allowed me to experience many hardships throughout childhood and beyond in order for me to come to the realization that I was spoiled, I didn’t appreciate what I had, didn’t even realize what I had I guess at one point, until my family hit rock bottom. It was rough, and don’t get me wrong, I hated it, and despised myself for many years afterwards because I felt so ashamed of my life. I was depressed, and that lead to me hurting myself and others in different ways, mostly subtle, but in the end, God knew that it would all work for my own good, so He allowed it. And I’m thankful for that, because now that I’m a parent, I can relate to the feeling of wanting my own children to appreciate what they have, and who they have in their lives, including God. And it would be so easy to continue to spoil them, sheerly out of the desire to show them love, but there is something to be said as well for tough love. As when you know that someone does not appreciate what they have, they need to experience a time of less – not to deprive, but to take note of all that they already have/who is in their lives, and to realize that they have much to be thankful for. Especially in this era we live in, at least in North America, where we have so much, so easily available to us, even those of us who are part of the ‘working poor’, we have SO much. How much do you need to live? Well, coming down to basics, we need to stay hydrated, and we need rest, and nutrients of some sort, and medical care when necessary, as well as shelter/clothing to keep us warm and safe. The rest is gravy really, but you would never say that to someone in our society, they would call you crazy. But really, TV’s, computers, furniture, cars, fancy clothing and devices, games, videos, etc., they are all extras. Sure, in our part of the world, we thrive on living online, using computers in pretty much every industry we have, but isn’t that a dangerous thing? Think about it – if anything was to happen to our electronics or internet, we’d all be in the dark – literally. We probably don’t have much skills to keep going, short of any possible camping skills we may have, or special training, but for many people, when the power goes out, they panic. It’s inevitable when your whole society is used to living off the latest technology. Anyways, where I’m going with this is, I have realized throughout my years of having less than everyone around me, that life will go on if I don’t have everything that everyone else has. That is because God knows what I need, and those things quite honestly, I don’t need. He may decide to bless me here and there with something extra special, (which He does), but He is more concerned about my walk with Him than showering me with the latest trendy stuff. As the responsible Father that He is, He allows me to struggle with some things for a while, usually until I realize that I can’t do it without Him, then He comes alongside of me and holds my hand. And THAT my friend is all the reminder that I need to know that I am blessed. Amen. As for me, well, summer’s been interesting… and tough. I must say, after being off work (outside the home) for two years, it takes some getting used to. I worked all the time at home of course, but now, with working later hours than I was used to before, and getting used to new responsibilities and a new schedule, I know it’s been taxing on my whole family. The kids for instance – they have been acting up more, and I’m sure part of that is due in part to my being away from home. They are used to me making them their lunch, taking them to the park, doing crafts or playing games etc., but now they must get used to doing things on their own, or with Daddy, though he works from home so it’s not too good for him in terms of getting things done. I know it’s hard on him too, as he’s used to me helping the kids out while he works and now he’s constantly interrupted. That’s part of the struggle with working from home with a family, but sadly few people really understand how hard it is. I appreciate that he can do it, because I know for myself, I find it difficult to concentrate on anything when the kids are around, playing, shouting, running around (and I usually end up feeling guilty doing my own thing, ignoring them). I need to wait until they’re in bed to do stuff that requires thinking, but by then I’m usually out to lunch as my brain says, “Okay, you’ve worked the whole day, now it’s time to shut ‘er down!” I’m sure you can at least relate to that little bit. And don’t even get me started on doing math at night, lol! I’ve tried to help my hubby with taxes, but late in the evening never works very well for me, but sadly that’s the only time I have to help out with this stuff. Let’s just say, its been trying. On top of other things, it’s been a rough summer, but I’m still thankful for all that I have, including a job, as it took 3+ solid months of job searching to finally find something, which is odd for me, but a sign of the times we live in. I know that God will use me in my new position, and He already has. Now I just need to adjust to the new type of atmosphere. It’s different being in ministry. I must say I’m not used to it yet, because this is my first real (paid) job for God, and it’s different than what I’m used to. However, it’s been good, just getting busier by the day, which is awesome, but now I need to practice balance and taking my breaks as I know that it’s good for my health and necessary. ;p That’s just the workaholic side of me stepping in, and my customer service ideals, but this girl has to start looking out for her own health too! Hopefully doing some exercise, and getting back into some personal projects will help with balance – that and spending time with God. Have a great week everyone, and don’t give up; God is with you!! Just wanted to share that I’m on a journey back to being myself. What do I mean by that? Well, pretty much ever since becoming a Mom, as probably most of you can relate, I’ve found that I’m drifting ever so slowly away from being myself – or rather, taking some time for ‘me time’. And yes, I do feel the guilt start to rise whenever I try to start doing something and of course a little one starts calling out my name or something else needs my attention. But as my hubby pointed out, he’s not playing the guilt trip thing anymore as a dad, so I shouldn’t do that to myself as a mom either. I need to shift my thinking as I’ve always found it easier to do stuff for others before doing stuff for myself. I think a lot of that has to do with different disappointments I’ve experienced in childhood and life afterwards, but it doesn’t mean it has to end that way. We all can take small steps to ensure that we don’t burnout because we’re ignoring ourselves completely. And let’s face it, it’s so easy to do this as a mom (or dad). I find though that moms just always worry about everyone else’s needs first, as I believe this is how we were made, as the typically supportive role, and emotionally it’s how we operate. We worry about everyone making sure they have their stuff before leaving the house that we often, (I believe), forget to take or do something for ourselves. At least that’s what I find for myself many times. And it’s frustrating, but I brush it off and try again the next day. On top of this, in the midst of soccer games, other events and everyday life, I find I just don’t have the energy to do anything I want to do for myself at the end of the day. And the idea of waking up extra early just to do them doesn’t really sound good to me either, but I also realize I need a bit of encouragement. I admit that. I’m so good at encouraging others to follow their dreams, but when it comes to myself, I tend to give up too soon or just leave things be. It’s just easier I guess not to be disappointed yet again. Like today, when I went to use the rest of a can of spray on primer to hopefully spray one side of a room divider I made, I was only able to coat two thirds of one side before I ran out of paint. Now I need to wait until I can afford more. But I’m going to try again… so please pray that I continue to enjoy the rest of the life God gave me in a way that is pleasing to Him and part of that is by enjoying being me. Thank you. I hope I’ve been able to reach out and touch at least one other soul out there who’s struggling with the same thing. Perhaps we can encourage each other? As I am always seeking to learn and grow in my faith in Christ, I started to look into personal study a while back, and I came across this show: Joseph Prince Ministries on TV. It is honestly one of the best ministries I’ve come across as every time I watch one of his sermons, I walk away with something deep to think about; something that God wants to tell me, and it’s awesome. This guy is definitely annointed as his sermons are powerful and full of God’s Word and the Gospel message. There is something truly refreshing about his sermons, and I think part of that is the fact that he does not beat around the bush so to speak, but rather, that he brings all facets of the bible to the forefront, and does not confine his topics to those that are typical of most churches in North America, or mainstream stuff. If this post resonates with you, I encourage you to head over to this site to watch some of his sermons: http://www.lightsource.com/ministry/joseph-prince-ministries/. He also has a website at www.josephprince.org. I pray that this ministry will be a blessing to you and yours as you seek to further your study of the Word. Today marks one year from the day that I went in for day surgery to clean out my body after having a miscarriage. Today last year I had to say goodbye to a baby I never met in person, but whom I carried for almost 3 months in my womb. Today I am sad, yet joyful that God made the decision He did as He knew that in this point in time we would not have the finances to care for another child, and that perhaps other issues would be at play. I miss our little one, but I am reminded that God Loves all of us, and His Ways are not mine, and His Plans are not my own, and that He does know best. It was a long road of depression to get to the place I am at now, and yes, I still grieve just not so often and the pain is not so intense as I know where my child is. And he or she is in Good Hands – God’s Hands. So in all this, I am reminded that I am not alone. If anyone reading this has recently miscarried, know this, that God Loves your child too, and he or she is in a better place. By all means, as much you love your child, we need to also realize, that no matter how much it hurts that we cannot see our little ones right now, that God is taking good care of them in Heaven. And Heaven is the best place to be – hey, it’s where I want to be – and it doesn’t get better than that! In Heaven, there is no pain, no sadness, no hurt, no hunger, no sin, no fears, just love. LOVE. Imagine that. Just love. I can’t wait!! I am reminded that God’s Love is all encompassing so much so that even in the midst of my despair, He is there, and He is changing me from the inside out, where it counts. I don’t need to carry all my hurts anymore, because I am a new creation in Christ. There IS hope, no matter what anyone else thinks, because He Is God. Amen. May God comfort all those who are hurting right now, and may He show you the joy and hope that He has in store for you. I was in a crafty mood so I suggested that the boys make some crafts for Easter, but before we did all this, I made sure to read them “The Easter Story”, which tells about Jesus’s time just before his death on the cross, and all the steps up to Easter Sunday. There is so much joy in sharing the Gospel with them and feeling their own wonderment at Jesus’s love for them. And hearing them sing God songs when I wake up in the morning, and they are playing makes me feel so happy. It really is music to my ears. 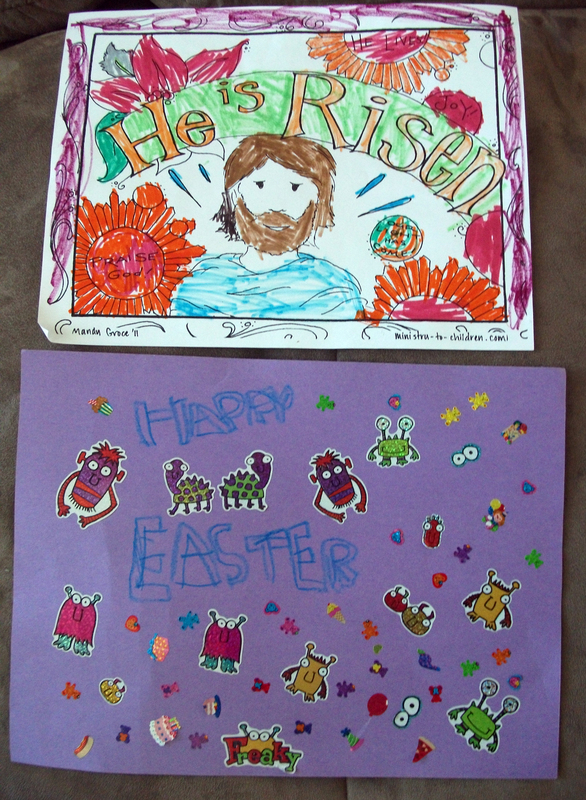 Well, this Easter, our boys decided to do different things – my youngest decided to colour a picture from Sunday school and to make a sign using stickers and writing, “Happy Easter”. My older son decided to use an egg carton and some Kinder Surprise eggs to make little egg people of our family and one of his friends. They turned out so cute! I love crafts! And in case you’re wondering, yes, I’m like a big kid! So I get just as much enjoyment doing this stuff as they do. I have another idea of something to make for Easter, we’ll see if I get around to doing them, but in the mean time I have some baking to do! Today we went to Good Friday service at our church, Riverwood Church, and it was very special to sit there with our oldest child and really reflect on the meaning behind today. There are so many significances to what happened in Jesus’s life, and throughout Easter, but we are just scratching the surface of what really happened. We do know that what Christ did for us on that cross was no easy matter. Even though he was God and man combined, he chose to take the ultimate wrath from His Father God, all for our sakes, that we might not have to be disciplined for our sins. And boy am I thankful He did. Try to think of how you react when someone treats you badly or doesn’t listen to you – does it make you want to bless them or be mean? I know that I have trying times, and it’s those times when I choose to obey God and show love instead of anger, that I know He smiles down upon me. It’s all too easy to react in anger, but to show grace as He has shown us… wow. Only through His Holy Spirit am I able to walk in His Ways. There are just so many things my heart is feeling today, but His Love is at the top of the list. Even though times are tough, and I don’t know what lies ahead, I can rest in the knowledge that my Father in Heaven is watching out for us, and I need not worry. When doubt creeps in, as it has these past couple of weeks, I must remember that He is here. Blessed are we, who believe in the Lord Jesus! May you all have a wonderful Easter weekend, and I pray that God will reveal Himself to you in a very powerful way. God Bless you! As I reflect on the 2nd week of this cleanse, I realize just how much self-control I’ve had to have, and I’m quite shocked at how well I’ve done so far. I mean, yes, it’s hard not snacking, especially on things that I crave like sugar and chips, but what’s even harder for me anyways, is the fact that I have to have soup for supper every single day! And normally I’d be fine having soup most days, but I’m one of those people who just really enjoys hearty soups – soups with some meat to them. I like potatoes and tomatoes, or to thicken soups with flour/cornstarch, but I can’t have any of those things on this diet. And last night was no exception – I finished off some spaghetti squash soup from the night before, and yes, it’s tasty because it has some sweetness to it, but either the texture or the sweetness made me feel like throwing up. I think I’m reaching my limit in terms of the soup thing, so I may have to resort to smoothies for suppers as well as my morning ones. I just really like thicker/heartier soups and this weak, all-veggie stuff is getting me down. Other than that, I’m happy to report that I’ve lost some poundage – 5 lbs to be exact. And that’s fine by me. I realize that I need to do more exercise in order to tone up more, but so far, I’m pleased that my pants are fitting me better. I’m still not down to what I was last january (before I got pregnant and had a miscarriage), but I’m getting there. My body just needs to get back to it’s normal metabolism/pace and I know the pounds will melt right off. At least that’s the way it’s always worked with me. I’m usually pretty good about eating healthy/keeping snacking in check, but I had gone through much depression last year, so it is even more significant to me that I’m doing this cleanse as it’s further motivation to keep eating right and to exercise more. I spent enough time feeling bad, which is fine, as everyone needs time to grieve, but now it’s time for change. I’m also in a transition phase of where I’m trying to earn some extra money for our family, through our book cover design business, and by trying to find work. Please pray for us that everything works out soon, as these are tough times and I am trying to keep faith that things will improve. I’m doing my part to move forward, I just need some extra help from above. Thanks! How are you doing today? As for me, I could use a bit of a boost as I wait upon the Lord to come through for us, but I know well enough to know that He will provide. There are times when life gets so crazy you don’t know what to do other than pray, and right now is one of those times where I just have to say, “Okay Lord, I know You’re in control, and You Love us, so I will keep praying and trust in You.” I think most of all, it’s important to keep trusting, and to be obedient, doing so because you love God of course, and not for the wrong reasons. And right now, to top off the craziness, my hubby and I are doing the Clean detox program, to help rid our bodies of any unhealthy junk that has built up over the years. It is a combination of proper eating and meditation/rest, and expelling said toxins through our skin via sweating/soaking in a tub, and regular bodily functions. ;p So far I’m on day 4, and it’s been a bit rough (moreso the lack of certain favourite foods), but really good for my brain. I seem to be able to think clearer, and have more energy. The first few days are the hardest, though it’s tough being tempted every time I go to a grocery store or preparing meals for the kids since they are not on the diet and can eat normal stuff. It’s worth it though if this will help my body to heal the way it was intended, as through talking to people and reading, I’ve heard so many good things about this diet. It’s up to you if you do the 1 week, 2 weeks or 3 weeks diet for complete detox, but so far I’m working on the 1 week plan. I have yet to lose any weight, but apparently it’s more common to lose weight in the second week. And I know I need to exercise more, as I am out of shape, though with only about 10 lbs to go, you just know those are the hardest ones to lose, (raise your hands ladies if you know what I’m talking about)! It’s a choice that I’m happy with though, and even excited to see the outcome of as I have never done a formal diet such as this, just the regular exercise routine/cutting out sugar and midnight snacking at times. I’m hoping my seasonal/pet allergies will be reduced and that my asthma will be gone completely (I haven’t had bad issues lately, but it does act up around animals and dust). Especially if at some point we get a dog (our kids want one and I wouldn’t mind having one around again, once we have a bigger yard), it will be good to not have so many allergies. But this program has also taught me much about staying informed about the chemicals that are in the foods we eat and in the air we breath, not in a paranoid way as it might for some people as I know that God blesses our food to our bodies’ use, but moreso in a way that encourages healthy choices. And in this day and age, making healthy choices in any area of our lives seems to be getting more difficult. I mean from keeping in touch using all the online devices (staying connected to the net at every turn instead of maintaining relationships in person), to eating processed/restaurant foods, to living a more sedentary lifestyle and spending less time with God, it’s no wonder our society is going downhill. And I struggle with all of the above at times, so I’m not saying I’m perfect either. I just recognize the need to go back to a more organic type of lifestyle. And I’m happy to say, that lately moreso, I’ve been finally finding peace with just being thankful for what I have/who is in my life and not trying to keep up with the Joneses’ (something I don’t actively do or care about, but something that my sinful side bothers me with at times). I think it’s important to keep perspective with regards to our relationships and what really matters. And if you struggle with this, ask yourself, “If I were on my deathbed today, what would I care about most?” It’s a simple question anyone can ask themselves to see how their life lines up with the things of importance, and if not, to question why it doesn’t. For me personally, I know I need to work on my relationships and on getting back to being me, hence I’ve been trying even harder lately to do so regardless of what society thinks. I know that not everyone agrees with my lifestyle choices or how I approach things, but that’s okay. I’m finally learning that it’s okay for people to not agree with what I think, even when they blatantly say it to your face (or online). I’m learning that so long as God is okay with me, then I’m okay with me. I’m also listening to some Joyce Meyer cd’s on healing and proper thinking, which are great btw, and trying to work on a better schedule at home. In the end, I just want to make sure I’m pleasing to my Creator. Something to think about perhaps? All the time. 😉 God Bless you all!